"EasyWebinar Makes Evergreen Webinars Effortless"
Setting up evergreen webinars is so simple that we've used several so far. We've seen such a fantastic return on investment after implementing a sales strategy that uses evergreen webinars that we now recommend this tool to anyone who asks about running evergreen webinars for their online business. This tool is an absolute must have for our business and any online business that's interested in making money and sharing their message while they sleep! I learn best by watching help videos or reading a quick article so because of that I wish there were more help articles for different features. Their knowledge base is, unfortunately, a little sparse, but they make up for this with amazing customer service that is very responsive, knowledgeable, and helpful. We've even had a customer service representative offer to get on a live zoom call with us to walk us through a setup issue we were experiencing. Make sure you test your webinar before going live for best results! This allows you to catch any bugs or issues so that you won't have any when you're live with your participants. We've made a lot of money since implementing this tool in our sales strategy using a set it and forget it sales funnel with Facebook ads and have made multiple thousands of dollars in passive income since implementing it. What I liked most using Easy Webinar was the ease of setting everything up. With me not being the best at technology it was very user friendly and I could even figure it out. I really like the easiness and ability to set up the webinars. After using this program for sometime in a previous postion I really have had zero issues with it. With all the updates and customer service this is a great product. Benefits of this product that I have realized are a lot of instruction videos which made set up easy. And It was nice to have the option to send reminders from EasyWebinar to registrants. "Small, simple, but solid platform"
We tested easywebinar when looking for a replacement for WebEx. easywebinar offered exactly what we needed in some ways: you can up your attendee limit for individual webinars at an affordable rate, so you won't have to pay for a super expensive plan if you don't often have big webinars. It had all the polling features, presenter features, and more that we wanted. And users don't need Flash! It seems to be a smaller platform and accordingly, it's not the best looking - aesthetics are definitely a weakness. Certain features are not obvious or easy to work with, like the ability to customize phone dial-in options or the extent to which you can rebrand. Make sure it will work for your needs - I'd strongly recommend this only to smaller organizations, such as nonprofits like ours, because it's definitely not as robust as a more expensive platform. However, it offers awesome flexibility. The big business problem we needed to solve was the ability to have large attendee limits on some of our webinars while being unable to budget for a top-of-the-line plan. easywebinar makes that super achievable for a small organization like ours because you can start with a basic plan and customize your limits per webinar. Easywebinar is pretty incredible. It has features for both live and automated webinars. I have no idea if there is another software that allows you to do so much while only using one platform. The customer support and coaching is very professional and extremely helpful! I definitely see the cost as a con. Also setting it up is confusing but there is someone always willing to help. Cons: The setup is a little confusing. You'll need to use video walkthrough's and probably get on a chat with the team. My least favorite thing was discovering I'd need to use 3rd party video hosting for my automated webinar. This is an added cost and it wasn't clear to me that Easywebinar doesn't host the video for the automated webinar. It helps provide an easier flow with getting things done in an easy and efficient manner. The layout is great, simple and easy to use. The tabs helps you to not forget any steps while planning things out. It's comfortable knowing you can change your mind and still being able to make a live webinar evergreen. I dislike having to use a live chat on through a third party. While there is a live chat box, it would be easier using it on Webinar. Also a calendar would be helpful as well. It provides a lot of different viewing times, which is great for the audience, and having control and my audience receiving a live experience is very helpful and beneficial. "Webinar service provides easy to use meeting solution"
Sometimes I think having more of a chat feature could be utilized more strategically and I've noticed in the competitors platforms. Think it's a affordable and reliable solution for users to take on. Solving remote teammates being involved in meetings to insure all people's opinion are being heard. The company my mom and I run love this product because of what we do. We do lectures for businesses, churches and organizations on ways to protect yourself. Since we do presentation lectures, then this platform is perfect with businesses across the US. We can perform from the comfort of our home. The only thing that I can complain about this product is that it does not work very well with my smartphone, and I have a Samsung. Like I said previously, we can lecture to people from the comfort of our home and reach a broader base. "Good product 👌 not for everyone"
Good product especially for evergreen webcasts, nice design. Seems like developers thought in advance for webcasters needs. Good support. "Pretty easy for this millennial "
I like that the program is easy to navigate and makes participating in webinars a breeze. Webinars often can take a while to do, but this program helps shorten the amount of time put into creating one. Easy webinar helps us provide training to a larger group of people without having to increase the number of times we present to them. In the end saved time and money. "The name says it all! " The ease of navigating the software. Very user friendly. No complaints at all. I along with my colleagues really liked this one in comparison to other programs we've used in the past. Virtual meetings allow us to work from home. I thought it was easy to use for all involved. Another company invited us to a webinar. Seemed easy to use to join in. Great for live webinars if you and your audience have very good internet connections. No comments function for simulated live webinars. Run live and simulated live webinars. Great experience and engagement when the audience had strong internet connection. "Good and awosome webinar platform"
Provide both automated and live webinars. Autoresponder integration, tagging, and easy payment options. I can reach with my audiences by using Easywebinar and get leads. Easy to use and set up, even for someone not so tech savvy. A bit pricey, so when it was first being implemented it didn't seem worth it. Allows webinars with collaborators in different time zones more easily. "Nice tool - no hassle." 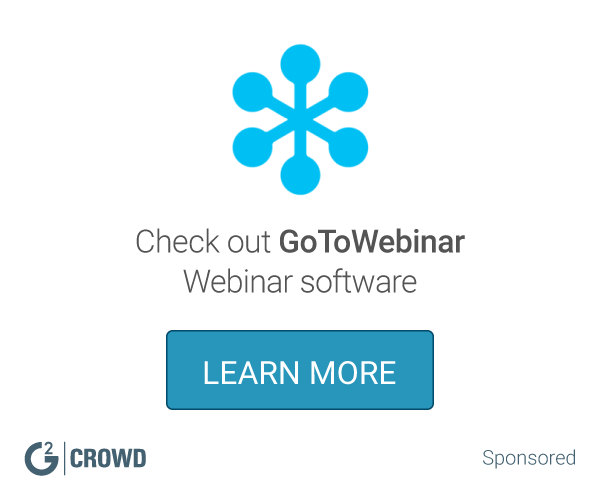 Easywebinar makes it simple to create, execute, and analyze webinars. Great tool - highly recommended. Nothing in particular. Pretty good tool. All in one webinar tool to streamline the entire process. Easy to use with a simple designed interface for the end user. Other similar tools had more features and functions available. Can be simplistic to setup and use. * We monitor all easywebinar reviews to prevent fraudulent reviews and keep review quality high. We do not post reviews by company employees or direct competitors. Validated reviews require the user to submit a screenshot of the product containing their user ID, in order to verify a user is an actual user of the product. Hi there! Are you looking to implement a solution like easywebinar?